When it comes time to die, be not like those whose hearts are filled with the fear of death, so when their time comes they weep and pray for a little more time to live their lives over again in a different way. Sing your death song, and die like a hero going home. It’s quite true that illegal immigrants come to America with far more and far worse than the clothes on their backs. They invade our nation carry with them a plethora of diseases and parasites, putting our people – especially our elderly and our children – at risk. And again, this is quite true despite our domestic enemies’ and their dutiful intelligentsia’s repeated claims to the contrary. 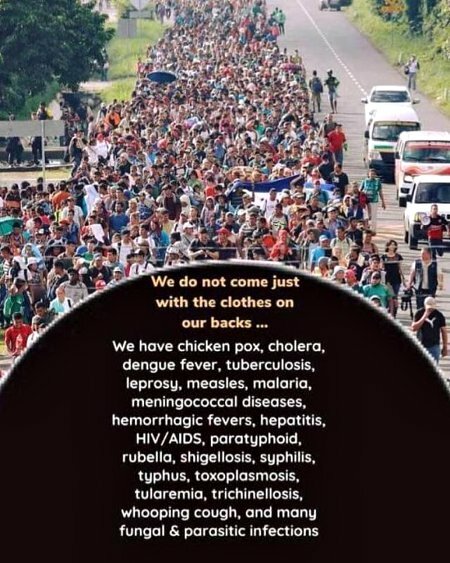 Their refutations are nothing but claims that there has been to-date “no significant” impact upon American society from immigrant-borne diseases and parasites. But by what criteria does one judge significance? And, when has America ever had to deal with an invasion of illegals at the scale that we now face? Our domestic enemies certainly have no consistent of objective answer to the question of significant impact. 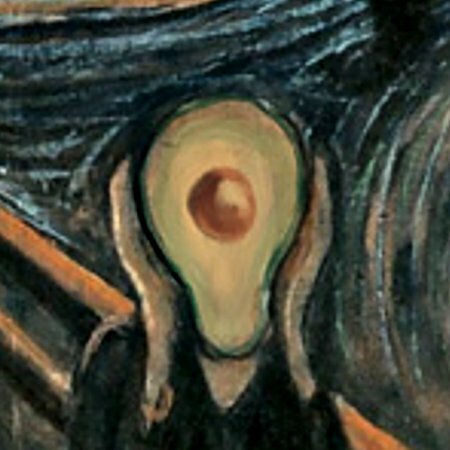 Just refer to how the scream about measles outbreaks and vilify the anti-vaxxers as some sort of apocalyptic plague bringers. And this is measles we’re talking about, not something far worse for either the victims or society as a whole. Yet they utterly ignore America’s most lethal and widespread disease, the common, ordinary, nameless Flu, which has an 18% mortality rate and claims the lives of 36,000 Americans annually, again mostly small children and the elderly. Yeah, those sorts who will say anything to refute the clear and present dangers and health risks that illegals present to Americans have no measurable basis for their stance on the issue. Then, like with most things, our domestic enemies’ stance on this is based upon Identity Politics and hate, not statistics or other repeatable facts. This entry was posted on Saturday, April 13th, 2019 at 9:25 am and is filed under Politics, Society. You can leave a response, or trackback from your own site. Yeah! Certain sorts that Americans are still having to deal with came up with this as a doomsday scenario in the event that President Trump used his lawful authority to close the US-Mexico border in response to the growing crisis there. Avocados! We won’t have Avocados! Holy guacamole, indeed! But then, this sort of hysterical lunacy is what happens when our domestic enemies try to come up with some sort of compelling reason that closing the US-Mexico border would be bad for- and/or somehow harm the American people. Admittedly, in the past some Dems have made more cogent, if heinous, arguments for keeping that border as open as possible while, perforce, not changing immigration laws. This entry was posted on Wednesday, April 3rd, 2019 at 12:54 pm and is filed under Politics. You can leave a response, or trackback from your own site. This entry was posted on Saturday, February 16th, 2019 at 8:44 am and is filed under Announcements. You can leave a response, or trackback from your own site. Well, even if Pelosi has never read anything else, she seems to have read and internalized Obama’s Audacity of Hope. 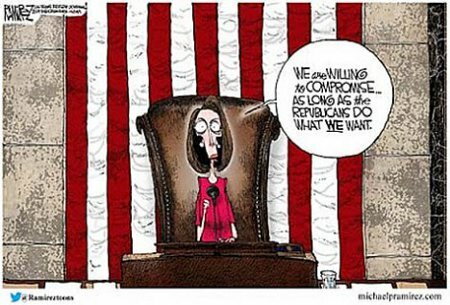 Her attitude towards reaching any form of compromise with President Trump and thereby ending the current partial government shutdown certainly match Obama’s prescription for similar things. Or, it could be mere coincidence. After all, Pelosi has the only reason she needs to refuse to do anything resembling responsible leadership of the House – Donald Trump was elected as POTUS. This entry was posted on Sunday, January 20th, 2019 at 10:52 am and is filed under Politics. You can leave a response, or trackback from your own site. « He Has No Clothes! Unlike Obama Era empty rhetoric, this is a real Red Line. 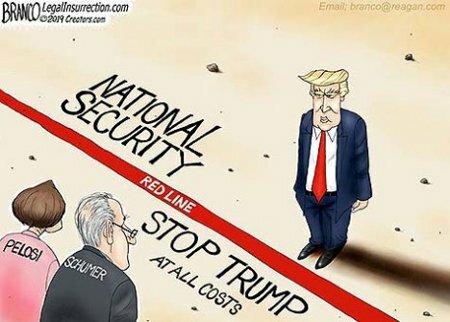 It has been drawn between our President, acting in the national security interests of the People and to deliver upon one of his campaign promises, and the Democrats, who will do anything to stop our President from doing anything. This entry was posted on Sunday, January 20th, 2019 at 6:00 am and is filed under Politics. You can leave a response, or trackback from your own site.